The base price for tuning is $105.00 - largely based on travel distance and the last time the piano was tuned. Fernandina, Yulee, Amelia Island is $105.00 as well, however, there is usually a week or so wait for scheduling. Here's a very good video explanation on the problems we face when tuning pianos that haven't been tuned regularly. Pianos that haven't been tuned in over 5 years almost always need a pitch raise and extra work. A pitch raise basically means tuning the piano twice. A pitch raise is $185.00 . This includes minor repairs and tuning the piano twice. The work is in the raising of the pitch. If your piano tuner isn't raising the pitch, he isn't doing the work, I see pianos all the time that clearly the piano tuner isn't raising the pitch. You can check and make sure he's tuning your piano to pitch with a piano tuning or guitar tuning app. I do repairs major and minor. From fixing a note that doesn't work correctly to rebuilding. Basic repairs are based on an hourly rate of $65 an hour. Rebuilding a grand piano consists of: new strings, new tuning pins, a new pin block (If it needs to be replaced) new hammers, new hammer shanks (includes new knuckles), new damper felts, new key bushings, new key tops, replacement of all the felts on the harp and a complete cleaning. Basically ... replacing all moving parts. Call for an estimate. Every piano is different. A 7-foot Steinway is going to be more expensive to rebuild than a 5-foot-1 Young Chang. Jason has been tuning my pianos for several years now. He always does an excellent job, not only tuning, but also performing maintenance! Quite a nice guy, as well. I was impressed with the quality,speed and friendly professional service i received on 10/25/2008. My Kimball Baby Grand went from unplayable to an amazing sounding instrument. I will certainly be using you for my ongoing Piano needs. I feel i found someone i can trust. Thanks again! 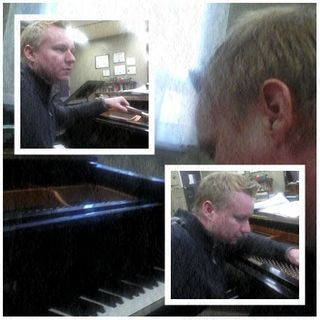 Jason has helped with qualifying a used piano for me and he was very knowledgeable and friendly. We haven't bought our piano yet but look forward to working with Jason in getting the right piano for us.